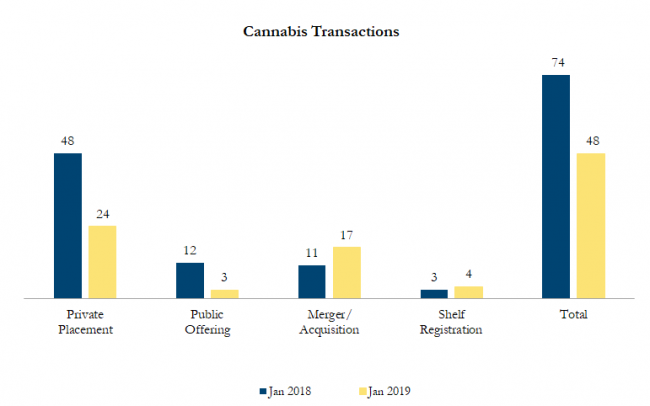 January 2019 Cannabis Transactions – Sinclair Range Inc. There were 48 transactions in the North American Cannabis sector in January 2019, including 24 private placements, 3 public offerings, 17 mergers & acquisitions and 4 shelf registrations, with a total value of C$5.0 billion. Total deal volume decreased by 35% over January 2018 and transaction value increased by 167%. On January 25, 2019, Aurora Cannabis Inc., a vertically integrated and horizontally diversified cannabis company, announced the closing its 5.5% convertible senior notes offering for gross proceeds of US$345 million, including US$45 million from the exercise of the over-allotment option. The notes are unsecured and will mature on February 28, 2024. The initial conversion rate for the notes is 138.37 common shares per US$1,000 principal amount of notes, equivalent to an initial conversion price of approximately US$7.23 per common share. The initial conversion rate represents a premium of approximately 10% to the common share closing sale price on the NYSE on January 17, 2019. Calculations include asset purchases and sales, joint ventures and minority and majority shareholdings that disclosed a transaction value and were announced within the time frame. Cannabis industry definition includes cannabis products producers as well as supporting industries such as suppliers, laboratories, and security, among others. Cancelled transactions were excluded. Exchange rates based on historical figures.